Fruit size is a highly important trait for most fruit and vegetable crops. This trait has been a main selection target and could be involved in divergent selection processes leading to the differentiation between modern table and wine cultivars. Even though its determination is highly influenced by cultural practices, several regions within the grapevine genome have been identified affecting berry size, either directly or indirectly through their effect on seed content. Using grapevine seeded cultivars, we have analyzed the relationship between ovary cell number and the final size of ovaries and berry fruits. 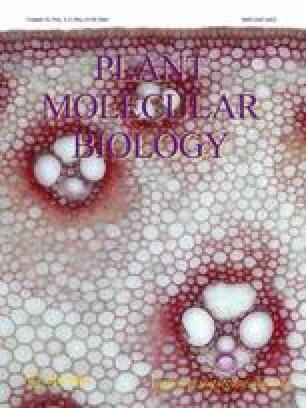 We also performed the characterization of the grapevine AINTEGUMENTA-LIKE family, since it is well reported in Arabidopsis that AINTEGUMENTA (ANT) regulates cell proliferation and organ growth in flower organ primordia by maintaining the meristematic competence of cells during organogenesis. Here we show that orthologous grapevine gene expression associate with flower developmental stages suggesting a similar biological role for this gene family in this species. Moreover, we detected a correlation between those organs size and the level of expression of VviANT1 the grapevine homolog of AtANT. This grapevine gene also co-localizes in linkage group 18 with the confidence interval of a previously detected QTL for berry size. Thus our results suggest the involvement of ANT in the regulation of berry size in grapevine. Constanza Chialva and Estefanía Eichler have contributed equally to the article. The online version of this article (doi: 10.1007/s11103-016-0443-1) contains supplementary material, which is available to authorized users. We thank Javier Ibañez for his helpful comments and invaluable data, Gerome Grimplet for nomenclature advice and Dante Gamboa for helping us with the histological analysis. This work was funded by The National Agency for Science and Technology Promotion (PICT-2008-00270 and PAE-PICT-2007-02360) and National University of Cuyo (SECTyP-A504A/11 and 06/A587) grants to D.L. Authors would like also to thank COST action FA1106 “Quality fruit”.